Snap is rethinking its power to the users approach to advertising. It’s considering making users view ads for at least three seconds before allowing them to skip them. The move is meant to alleviate concerns by advertisers for both Snapchat and Instagram that its users tend to skip ads within less than one second. The move is more of a surprise for Snapchat to make than Facebook (which has expressed no such plans) because Snapchat has been very careful not to impose too much of a restriction on its users when it comes to ads. That being said, Snap is now a public company, and it is under pressure from advertisers to prove its effectiveness and willingness to cooperate. Snapchat was once the darling in the social media space with advertisers ready to fork over millions of dollars to try out the platform. Now, advertisers are being more careful and more deliberate and considering what Snapchat can really do for them. The short ad views have been a frustration, so it wouldn’t be a surprise if Snap were to implement the requirement. And, in turn, it wouldn’t be a surprise for Facebook to adopt a similar requirement for Instagram Stories. Instagram’s algorithm will be bringing posts into users’ feeds from accounts they don’t follow under a new “recommended for you” tag. The algorithm will determine what to bring into user’s feeds based on the likes of people the user follows. The move is meant to create more ad inventory across the Facebook advertising network. Lack of inventory has been Facebook’s biggest challenge as of late. This is meant to get users to spend more time in Instagram and, in turn, have the opportunity to view more ads. Snapchat has launched “Stories Everywhere” as a tool for publishers to post their Snapchat videos outside of the Snapchat app. This breaks content outside of the Snapchat ecosystem, which has been notoriously insular up until now. The move could give Snapchat a greater footprint and more exposure to users not on the platform, benefiting Snapchat as much as publishers. Twitter took a similar approach when it allowed publishers to embed tweets on websites. Dish Network is working with Comscore to measure addressable ads targeted to individual households, whether they’re viewed on TV or through over-the-top service Sling, which is owned by Dish. Right now, Dish measures ads that run through Dish’s traditional satellite television offering. This would combine data on ads viewed digitally as well as through traditional television, allowing advertisers to have a better understanding on how their ads are performing across the television ecosystem. Instagram Stories have been a resounding success, and Facebook’s doing what it can to elevate them even more. It started by allowing users to share Instagram Stories to Facebook Stories. Now, it is testing the ability to let users post Instagram Stories to WhatsApp as a WhatsApp Status, which is similar to a story update. Much like Facebook Stories, the move could be intended to generate more attention for and usage of WhatsApp Status by tapping into an already popular behavior. This would in turn encourage WhatsApp users to spend more time in the app. 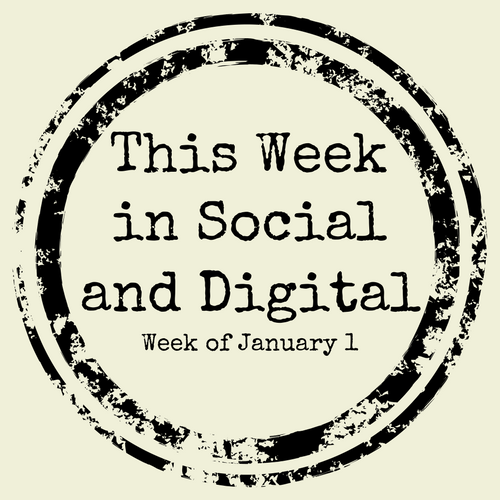 Tagged with This Week in Social, Digital, Social Media, Marketing, Advertising, News, Snapchat, Snap Ads, Viewability, Instagram, Stories Everywhere, Dish Network, Comscore, Sling, Instagram Stories, WhatsApp. January 7, 2018 by Taylor Wiegert.